A subtle and chic mix of 9ct white gold and blue topaz in a figure of eight design. A stunning gift for the love of your life. 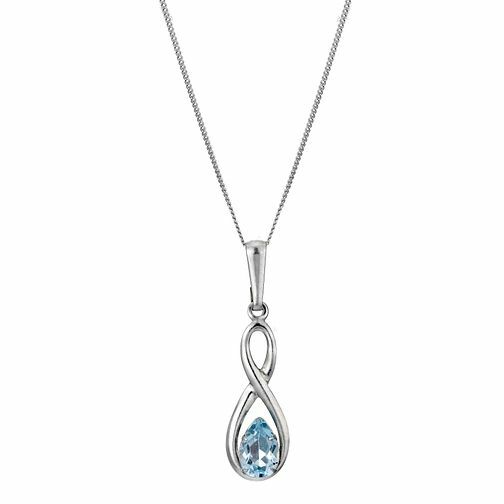 9ct White Gold Blue Topaz Figure of Eight Pendant is rated 3.6 out of 5 by 26. Rated 3 out of 5 by Anonymous from Stunning but too small for me My partner bought this stunning necklace for me for Xmas. It's delicate, beautiful and I was over the moon about it......until I put it on. The chain is understandably thin but unfortunately it needed to be longer - or at least have the option of longer chains. I had to return it to the store but I did get a equally stunning necklace and the staff were so helpful! Rated 5 out of 5 by Anonymous from For someone special I bought this as a gift and the receipiant was delighted. A delicate necklace with a beautiful stone in a lovely setting.